On May 14, 2018, when the Supreme Court overturned the ban on sports betting, New Jersey legislators hurried to update the state’s 2014 sports betting law. Back in 2014, Jersey lawmakers had passed a law permitting sports betting at casinos and racetracks, but the law couldn’t go into effect until the Supreme Court overturned the Professional and Amateur Sports Protection Act (PASPA). 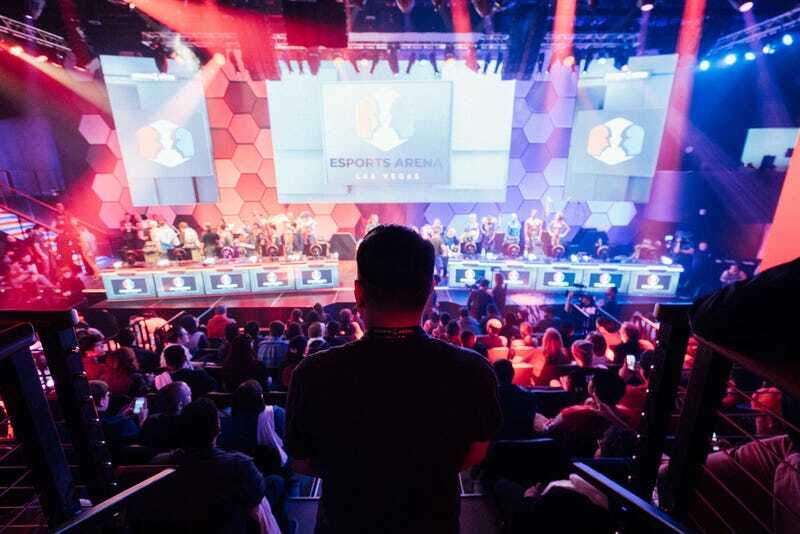 Ever since the Supreme Court decision, New Jersey has rushed to put together an updated sports betting bill, and over the course of their deliberations, state legislators added in a ban on esports betting. Legislators added numerous changes to the rough draft of the bill before finalizing its language and voting it forward to the governor’s desk on June 4, 2018. Between the May 14 draft and the June 4 vote, esports somehow got added into the mix. New Jersey legislators did not respond to repeated requests for comment from Compete about the wording of the law, but as written, the sentence may leave some wiggle room for esports betting operators. For example, Blizzard Entertainment’s Overwatch League features international esports teams and requires that all participants be over the age of 18. The League of Legends Championship Series, which is also an international competition, stipulates in their rulebook that all competitors must be at least 17. But esports betting and esports as a whole are still relatively uncharted territory, and in 2014, when New Jersey first put a law on the books about sports betting, the League of Legends Championship Series was in its infancy, and Overwatch League was years away from existing. Nevada allowed the first-ever legal esports bets two years later in 2016, after William Hill US “received permission from the Nevada Gaming Control Board to offer betting on an esports competition,” Wallach explained. By 2016, New Jersey had already been fighting against the sports betting ban for five years, with their last option being a petition to the Supreme Court. As New Jersey’s journey towards legalization moved slowly forward, the esports industry continued to grow and change. In the early 2010s, the world of esports betting mostly revolved around “skin betting,” the practice of using items from games like Counter-Strike as tokens in online wagers. The Washington State Gambling Commission brought criminal charges against skin gambling rings in 2016, which shut down most of the major players, but smaller sites continued to offer unregulated, scam-filled bets to anyone willing to risk it—including underage bettors. Although NJ lawmakers did not clarify to Compete as to why this specific language ended up in the bill, Wallach speculated that it could be due to esports betting’s shady reputation. “You have to remember, PASPA just fell a couple of weeks ago. We’re starting from scratch here, and esports potentially presents greater integrity issues than traditional sports, for the reasons that have been written about extensively,” Wallach said. Debates over how to include esports betting in the bill could have slowed down its progress, and Wallach believes that New Jersey didn’t want to wait that long. New Jersey lawmakers could stand to reconsider esports betting operators’ case, though, because a lot has changed in the years since New Jersey put forth their 2014 law. The esports betting industry has tried to clean up its act and shake off its sketchy reputation, thanks in part to the founding of the Esports Integrity Coalition in 2016, as well as esports-focused betting operators like Unikrn, founded in 2014. Via email to Compete, Unikrn’s CEO Rahul Sood spoke out against New Jersey’s clause about esports betting. Other states aren’t going to rush as much as New Jersey did, though, except for Delaware, a state that also already allowed minimal sports gambling (specifically, NFL parlays) before the Supreme Court decision. Delaware has since pushed out an updated bill that allows casinos to offer bets on traditional sports. That bill doesn’t mention esports, but for now, casinos in the state haven’t yet offered esports contests alongside their first legal sports bets. Other states, theorizes Wallach, will probably take their time to deliberate all of the options—including the question of esports betting.